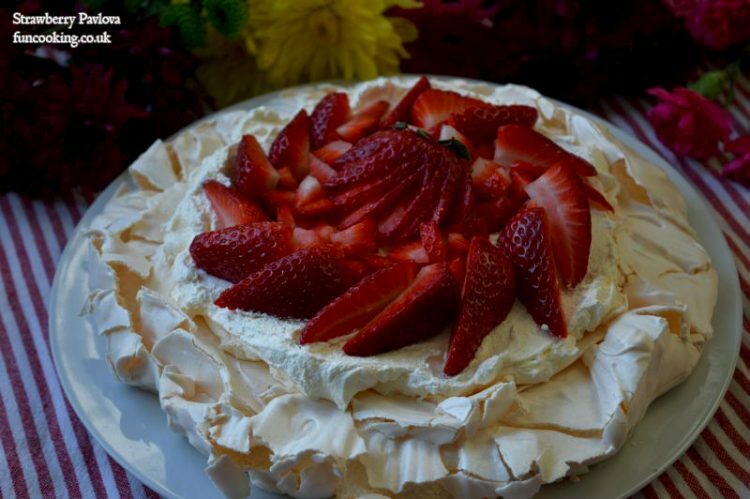 The perfect Pavlova should be snowy white, crisp on the outside and slightly marshmallowy on the inside. 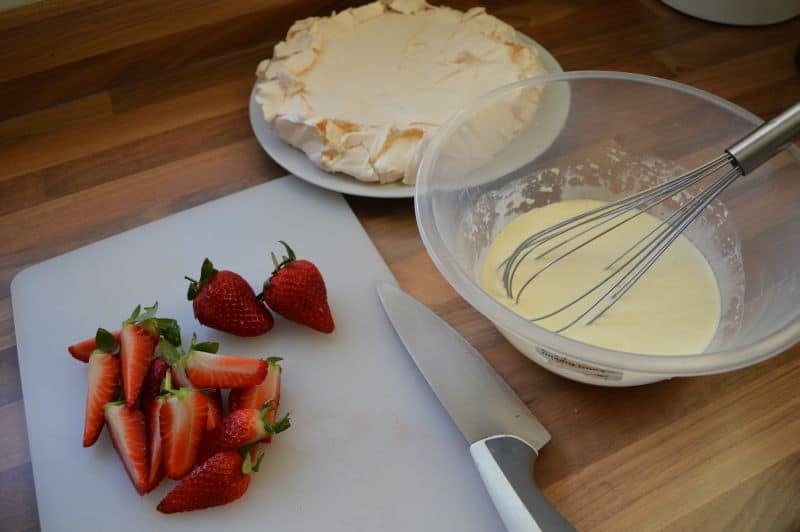 Getting it right each time is easy if you follow a few basic things and there’s also tips based on personal pavlova mistakes! 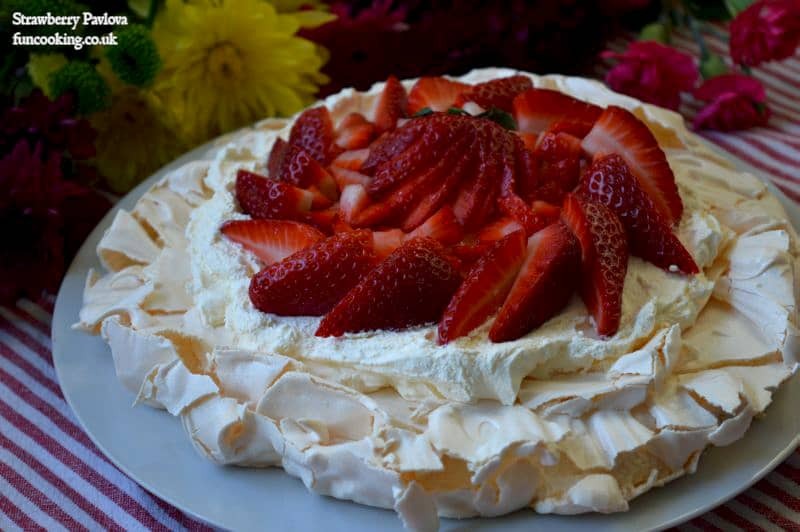 Pavlova is made from egg whites and sugar and has a unique squidgy texture. 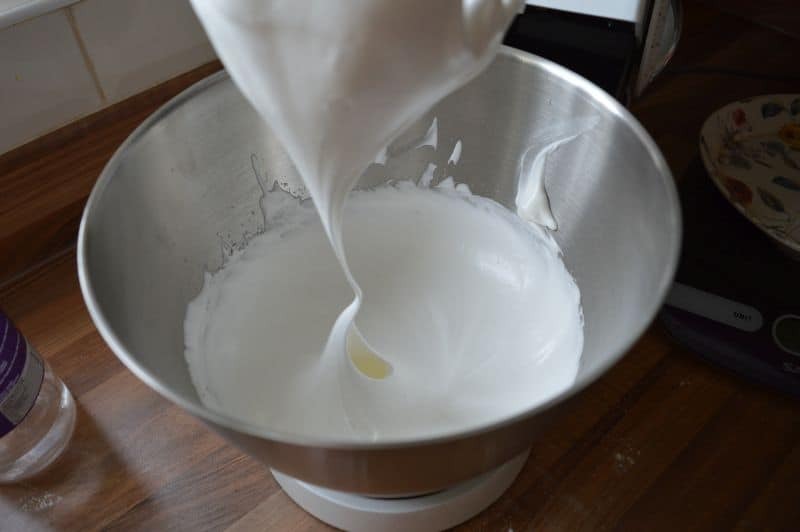 The egg whites are whipped until firm and then the sugar is gradually added until the meringue is glossy and so thick. 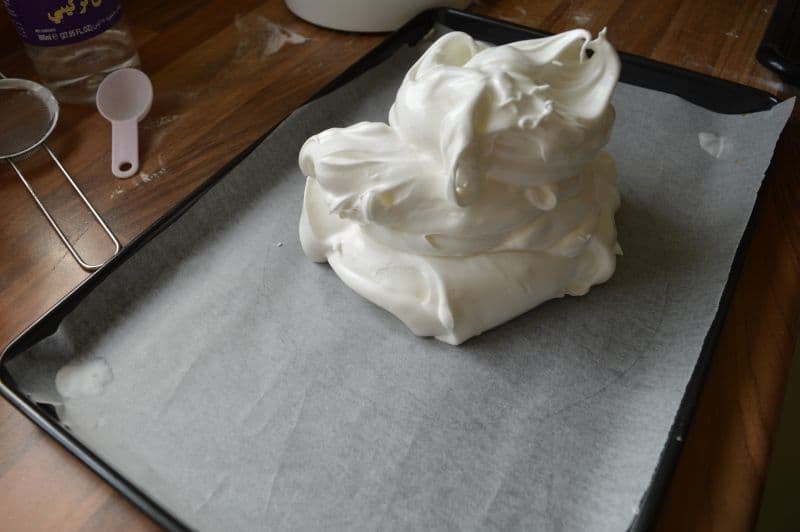 The meringue can be spread with a spoon on a tray lined with grease proof paper or piped . 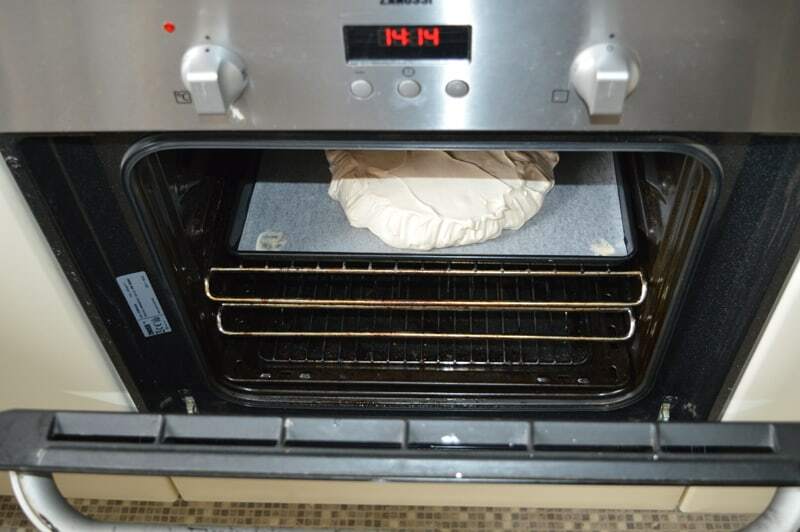 It is very important to let the pavlova cool gradually inside the turned-off oven once baked this helps it stay crisp. 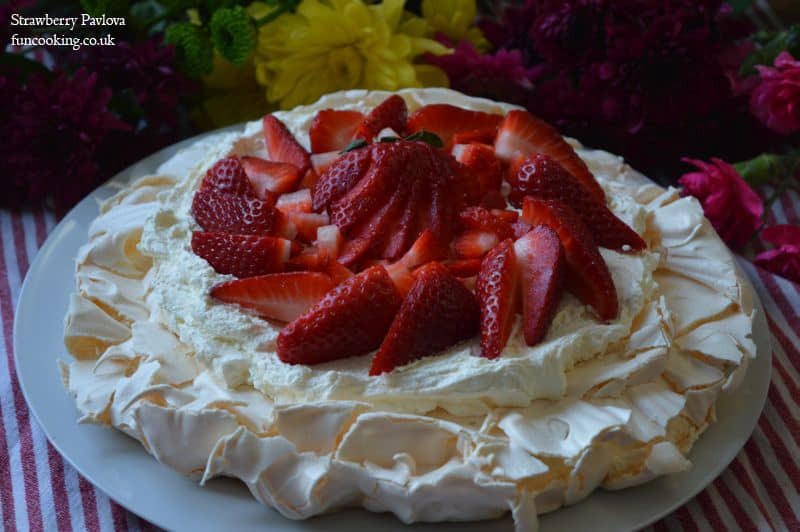 Once your pavlova is baked and cooled it can be filled with freshly whipped sweetened cream and fresh berries which undercut some of the sweetness.I am making Strawberry pavlova today. 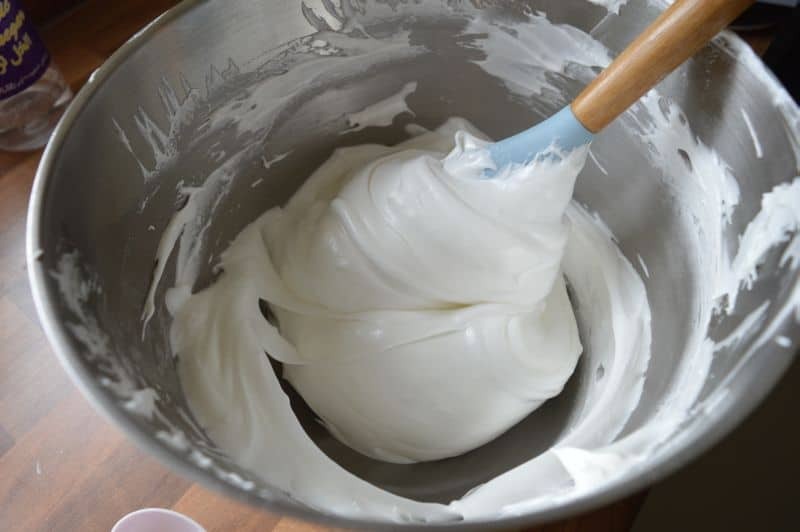 Meringue is not whipping! First of all you have to make sure that no egg yolk goes into your egg whites otherwise they won’t whip up no matter how hard you try. 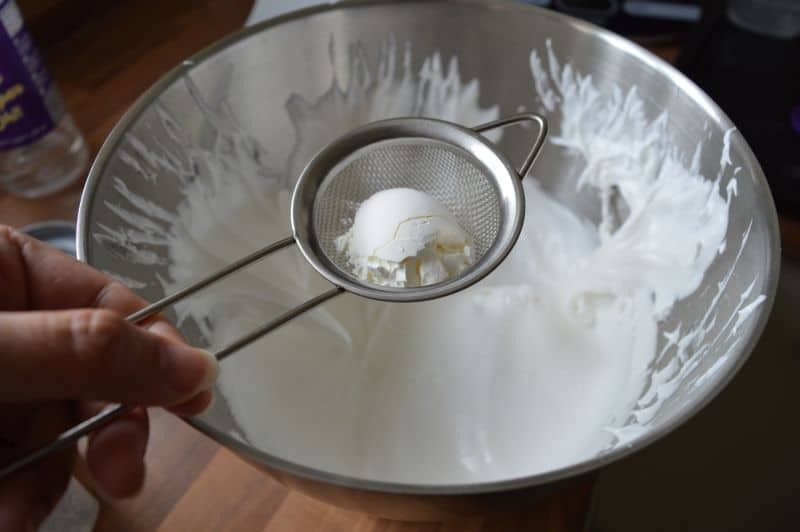 Secondly you have to make sure the mixing bowl and beaters are perfectly clean and free of any grease. For that reason it is best to use a metal or glass bowl as plastic can hold on to grease. What type of egg whites? You can use room temperature eggs or pasteurized egg whites. My pavlova is weeping! Make sure the sugar is completely dissolved before baking. 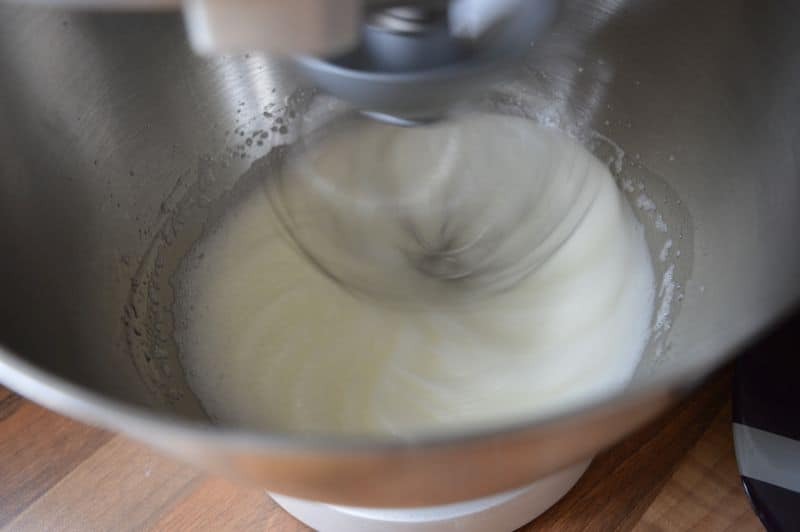 Feel the meringue between your fingers, if it is gritty then you need to keep whisking. Another thing to watch out is over whipping the eggs. My pavlova is completely flat! Usually too hot oven do this. I usually preheat the oven to 180C but reduce the heat to 130C when the pavlova goes in. The cooking time is 45 minutes. You might need to experiment to see what temperature works best for you and your oven. If in doubt, cook at a slightly lower temperature for a little longer. 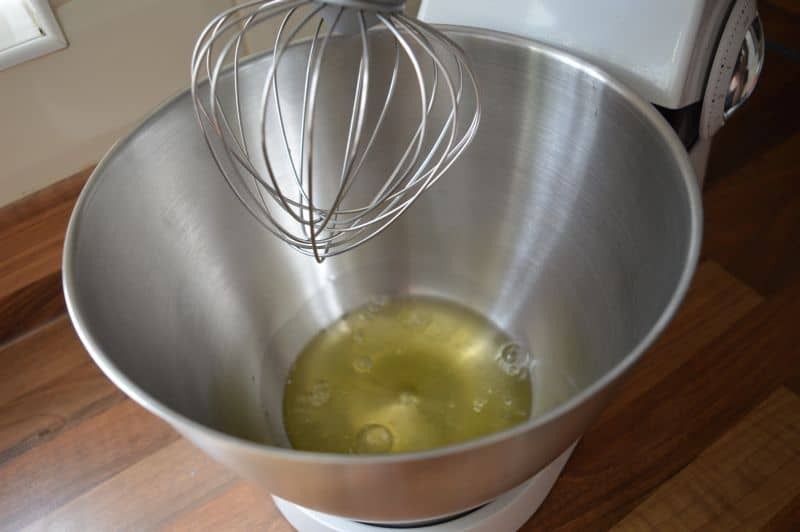 In a clean dry bowl of a stand mixer add room temperature egg whites. Beat until you see light peaks form. Now start adding caster sugar a little at a time and keep beating. Beat until stiff peaks form and meringue is no more gritty when you touch it. Now add 2 tbsp sieved cornflour and 1/2 tsp white vinegar. 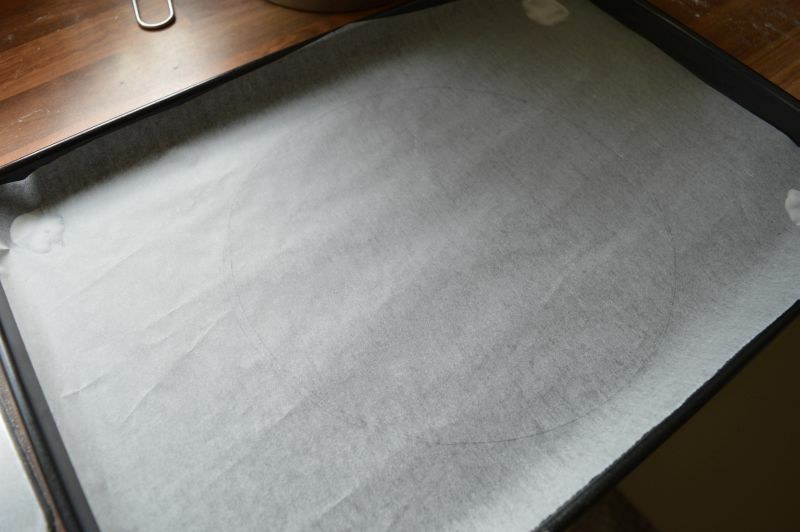 On a baking tray place grease proof paper. 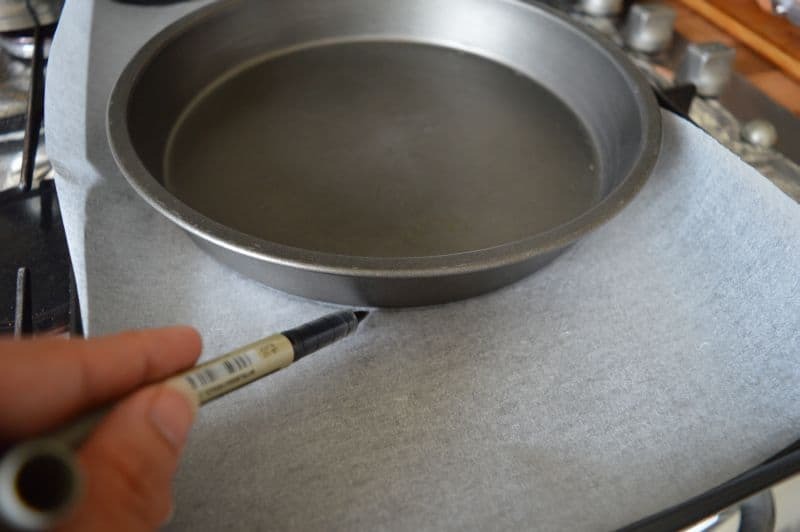 Keep a 8 inch cake pan on it and draw a round circle. Flip the paper so you can see the round mark but that will not touch your meringue. Shape it round with a spoon or fork. 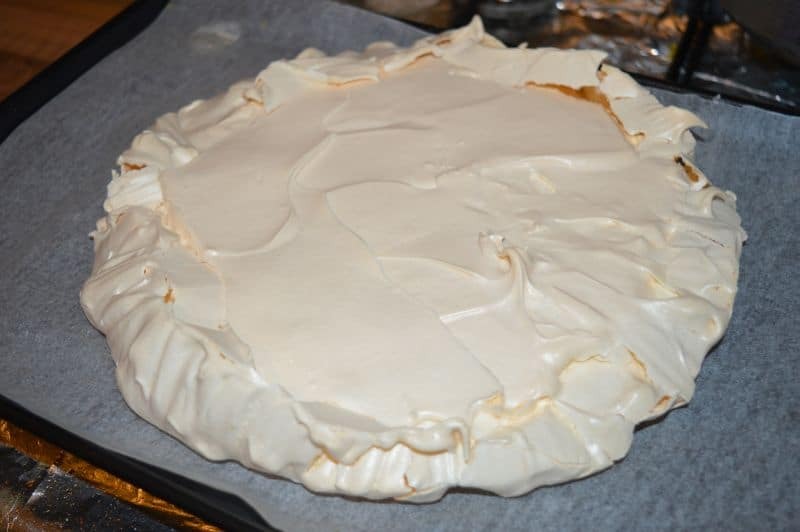 Preheat the oven at 180 C. reduce it to 130 C when you put meringue inside. Bake for 45 minutes. 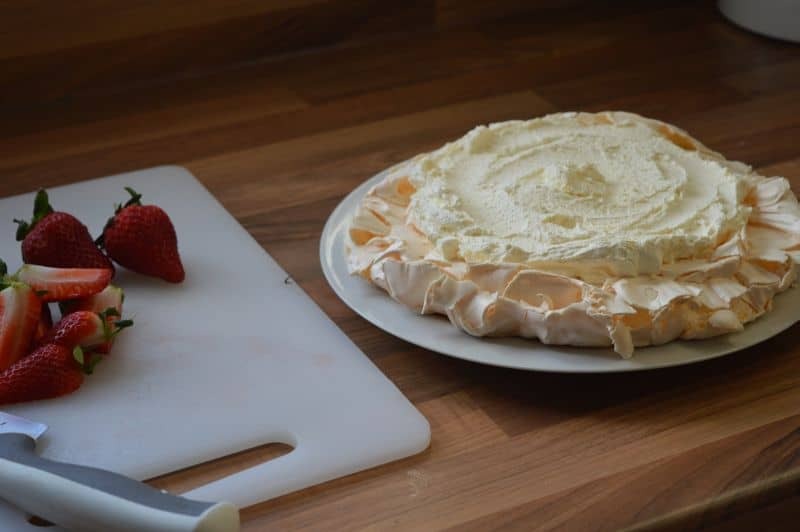 After baking turn off the oven and let the pavlova inside for 1 hour or until cool. Cut strawberries and whip double cream with 1/2 tbsp icing sugar until stiff peaks. 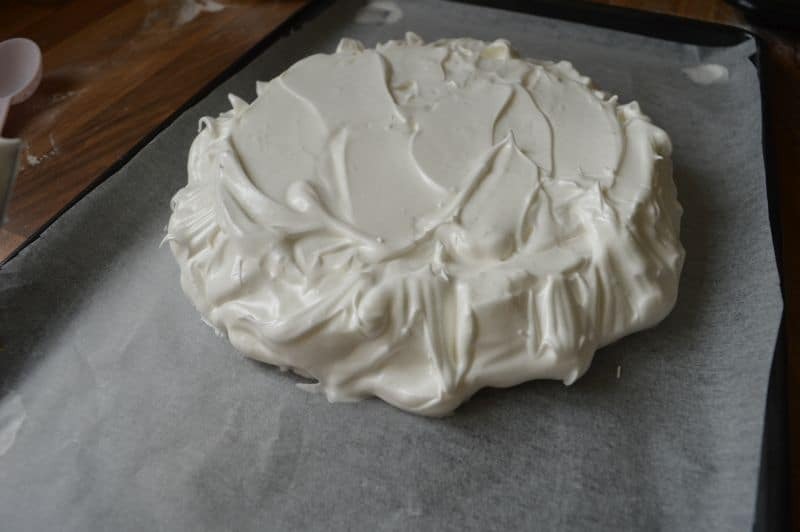 place whipped cream in middle of pavlova. Arrange strawberries on it and it is done.